With the ice storm here, we never had the last six days of school before the holidays. (It would have been really fun except for the part where we had no power for 12 days.) Because of that, Eve was not able to give her teachers their holiday gifts. I originally intended to give them with Christmas cards, but the time has clearly passed for that! So I made up some Happy New Year to give with the gifts. I knew that I wanted to use the champagne glasses from “Cheers to You” and the Top Note Die. 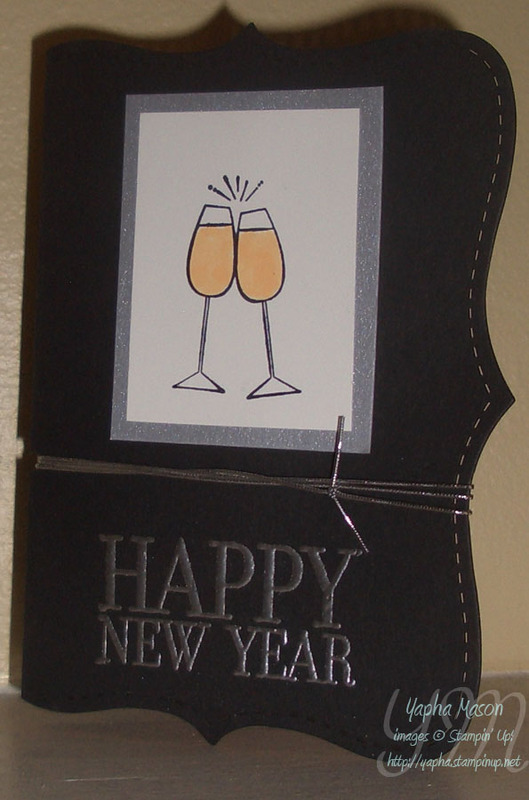 I only have the silver elastic cord, not the gold, so I figured I would emboss “Happy New Year” in silver on black. But I was unsure about what color to use as a background. After much deliberation, I decided to make a card out of just the Top Note! I folded the paper for the Top Note before running it through the Big Shot, making sure that the fold was inside the lines of the die. I lined the inside of the card with Apricot Appeal paper to make a place to write. I liked the way the Apricot Appeal looked against the Basic Black, so I made another version of the card, in standard size, with an Apricot Appeal base. Wishing you all a happy and healthy 2009. May it be all that you wish! Visit Studio 5 for a fabulous video of Shelli Gardner (co-founder and CEO of Stampin’ Up!) creating three different holiday place settings for Thanksgiving, Christmas, and New Year’s Eve! Make card stock note using Top Note Bigz die. Adhere Designer Series paper on card stock, stamp (on New Year’s napkin ring), fold, and smooth folds using bone folder. Stamp label image, punch out and/or cut, and adhere to napkin ring. Punch out slots and tie together with ribbon (Note: New Year’s napkin ring is tied together with Silver elastic cord). Accent as shown. 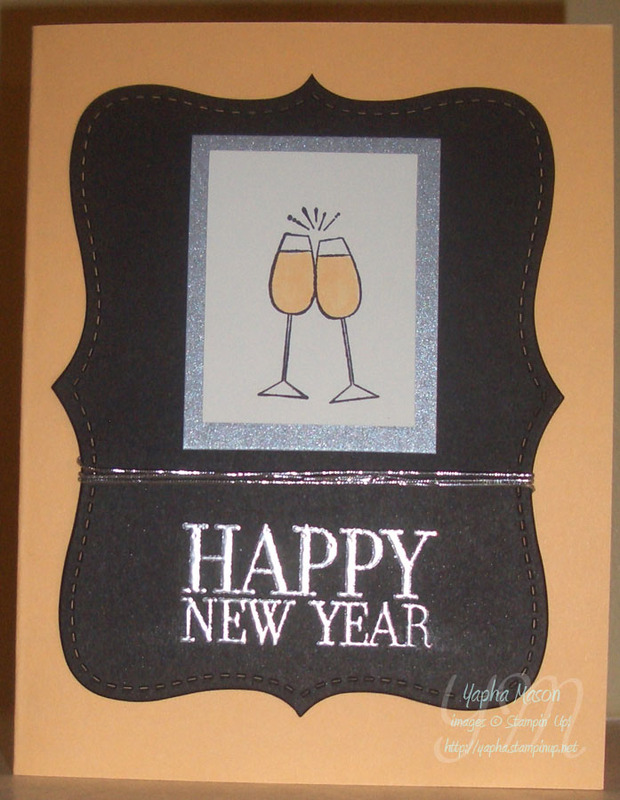 Make card stock note using Top Note Bigz die; stamp (on New Year’s name plate), fold in half, and smooth fold with bone folder. Adhere Designer Series paper on card stock (Note: layer paper on Old Olive card stock first for Christmas name plate). Accent as shown. Make favor box using Pillow Box die, and fill with treats. 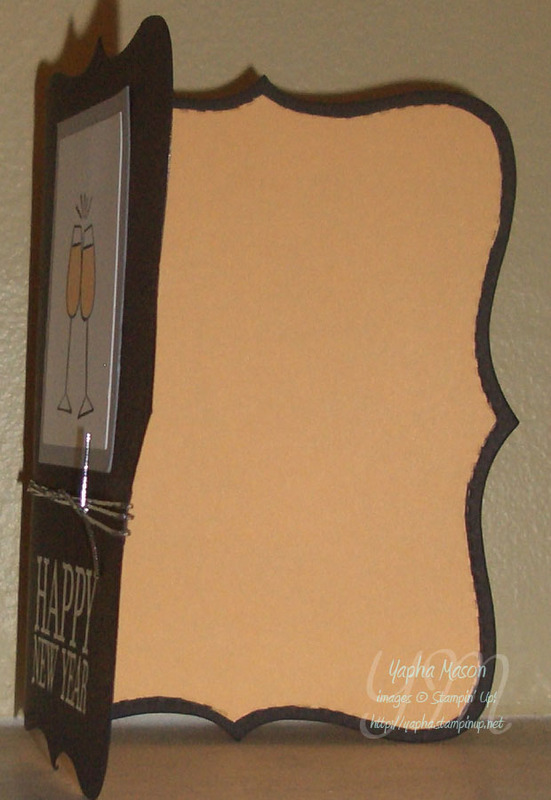 Create belly band out of Designer Series paper (Note: layer paper for New Year’s favor), and adhere to favor. Stamp label image, and punch out. Adhere label and accent as shown. Make several large and small scallop circles out of Designer Series paper. Stamp and cut out/punch smaller images (acorns for Thanksgiving, trees for Christmas, and snowflakes for New Year’s) as shown. Glue glitter on snowflakes. Contact me at yapha@yahoo.com for more information or to purchase any of the supplies needed to create these beautiful place settings!